Producing silk cloth is a lenghty and complex process, and to achieve a high-qaulity product one must take a wide range of factors into account. Silk is a natural protein fiber composed mainly of fibroin. It is produced by certain insect larvae who use it to create their cocoons. The best-known silk is the type obtained from the larvae of the species Bombyx mori. In English, this insect is known as Domestic silkmoth, and the larvae are referred to as silkworms even though they aren’t worms. Domestic silkmoths have been selectively bred for the silk industry for millenia and are closely dependent on humans. The favorite food of the silkworm is white mullberry leaves, although they may eat other mulberry species in a pinch. The female silk moth lays circa 300-500 eggs on a mullberry tree. Larvae (caterpillars) hatch out of the eggs. They are called silkworms. The silkworms feed on mulberry leaves. As the silkworms grow bigger, they need to moult several times. After having gone through its fourth moult, the silkworm is ready to transform into a moth. It climbs to a twig and starts extruding a silk fiber to spin a net. While the net is holding the silkworm, the animal swings repeatedly from side to side in a figure 8 pattern. While doing this, it is distributing fibroin protein and a gum called sericin from its two salivary glands. The silk solidifies when it comes into contact with the air. The silkworm gradually encloses itself in a cocoon. Making a complete cocoon typically takes two to three days. The intact cocoon is harvested, with the silkworm still inside. The cocoons are boiled, killing the silkworm. The hot water also removes the sericin. The cocoon is brushed to locate the outer end of the filament. The filament is wound on a reel. At this point, the product is called raw silk. 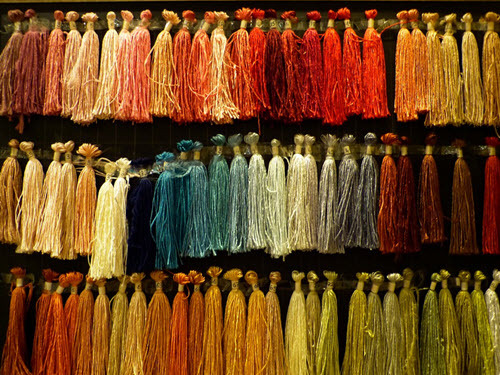 It takes roughly 2,500 cocoons to produce a pound of raw silk.A silk thread is comprised of several filaments, and several threads can be plied to form a yarn. Typically, one thread will consists of between five and eight filaments. 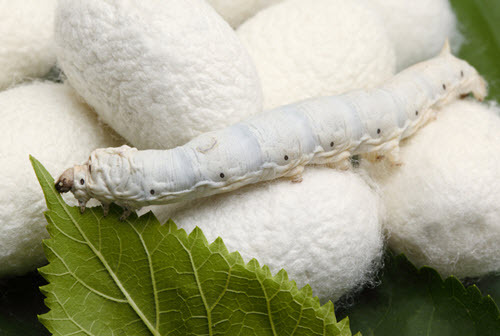 In the 20th and 21st century, silk production has been critized for boiling the silkworm. Some critics have opposed killing it at all, while others are more concerned with the fact that it is killed by being boiled alive. 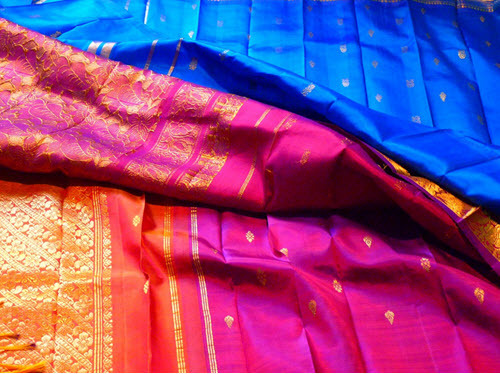 Mahatma Gandhi was critical of silk production since he saw it as a violation of Ahimsa. He promoted Ahimsa Silk, also known as Peace Silk, where you allow the moth to become fully developed and only use the cocoon that is no longer needed by the animal. The domestic silkmoth (Bombyx mori) is both blind and flightless. The female Bombyx mori lays her eggs in four to six days anddies soon after. Each egg is very small, and roughly 30,000 silkworms can emerge from just 1 ounce (circa 28 grams) of eggs. If you have 30,000 silkworms, you need to provide them with about a ton of mulberry leaves to eat before they start making their cocoons. From their cocoons, roughly 12 lbs (5.4 kg) of raw silk can be obtained. The closet relative of Bombyx mori is the wild Bombyx mandarina, which lives in China, Korea and Japan. This wild moth is capable of both seeing and flying. Many silkfamers keep the eggs at 65 degrees F, and then gradually increase the temperature to 77 degrees F.
Domestic silkworms are typically fed hand-picked and chopped leaves from the white mullberry tree. They eat both day and night, and a silkworm can multiply its weight 10,000 times in a month. A room packed with silkworms feeding on leaves is quite noisy; it sounds a bit like heavy rain falling on a roof. Traditional silkworm farmers are very protective of their animals and meticolously shelter them from the outside world. It is for instance considered very bad if the silkworms are exposed to shouting, or the smell of fish, meat or sweat. The cocoons are look like puffy, white balls. Traditionally, they are kept in a warm and dry place for eight or nine days before being boiled. They can also be steamed or baked, before being dipped into hot water to remove the gum from the fiber.